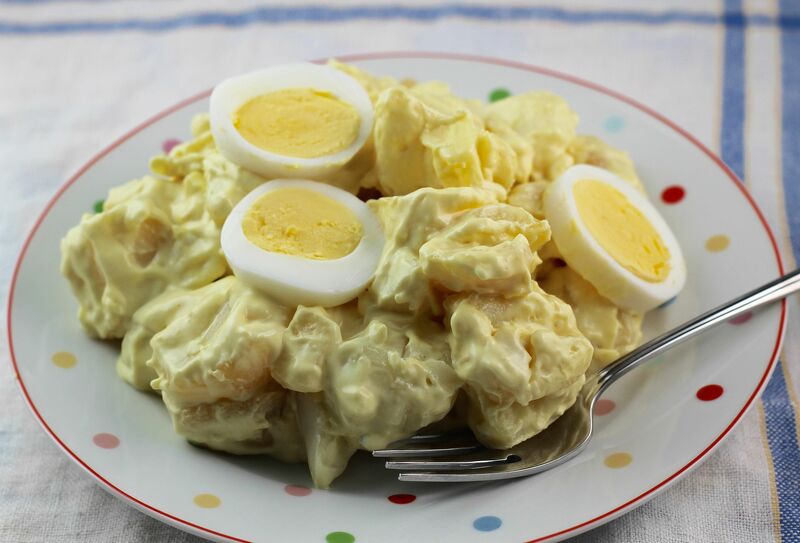 Summer is potato salad time! This creamy and delicious side dish or main dish salad is perfect for hot summer days. There's something about tender potatoes enveloped in a velvety and smooth dressing that is so comforting and delicious. You can add just about anything, and you can use just about any potato. These best potato salad recipes, whether traditional or made with a twist, are all quick, easy, and delicious. This is the best potato salad we've ever eaten. The dressing has the perfect combination of velvety smoothness, luscious creaminess, and mild, fresh flavor. And the potatoes -- you must use red potatoes, boiled until tender. They become creamy and perfect and blend so well with the dressing. This salad comes in second our rating. It's easier to make, because you cube the potatoes, then roast them with onions and garlic. We like to add green beans, cherry tomaotes, and sometimes chicken to this salad to make it hearty and perfect for dinner. If you don't have time to boil and peel all those potatoes, use Mother's potato salad dressing with frozen or refrigerated hash brown potatoes. You can all of the flavor with none of the work! We saw this salad at a deli and had to reproduce it. We used a variation of Mother's potato salad dressing recipe and added bacon, of course. This is simply sublime. A hot potato salad! This one is perfect for those cool summer evenings that come along every now and then. We think that the sweet-and-sour balance in this recipe is perfect with the slightly spicy sausages and tender and creamy potatoes. This fabulous salad is easy to make and you don't have to use any heat at all! Canned sweet potatoes, plus Durkee's sandwich spread, are the secret ingredients in this flavorful and cool salad. Well, who wouldn't like the flavors of Buffalo chicken wings in a potato salad? Blue cheese, hot sauce, and celery add flavor to frozen steak fries that are baked until tender yet crisp on the edges. This is one of my all-time favorite potato salads. A cream cheese-based dressing is the secret behind this fabulous potato salad. Use the best quality tuna you can find for a simply outstanding recipe. We always have to include a pesto recipe on a "best of" list! This recipe is hearty and delicious, with just the right blend of flavors. You can leave out the chicken and have a fabulous side dish for your next cookout.